This page is about the American twin-engine fighter P-38J-15. 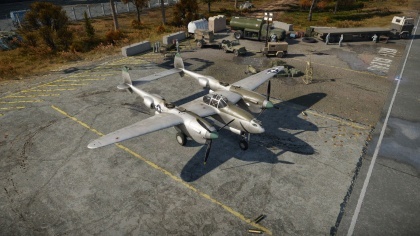 For other uses, see P-38 (Family). The P-38J-15 Lightning is a rank IV American heavy fighter with a battle rating of 4.3 (AB/RB) and 4.0 (SB). It was introduced in Update 1.53 "Firestorm". The P-38J is a sleekly designed, two-engine monoplane made by Lockheed. This plane has a top speed of 431 mph (694 km/h) and a VNE of 460 mph (740 kph). Its main armament consists of 1 x AN/M2 20 mm cannon and 4 x 12.7 mm Browning machine guns. With upgrades, the Lightning can function as a multi-role fighter with bazooka rockets or bombs to help lead your team to victory, both in the air and on the ground. When playing the P-38J, climb to a high altitude, search for the enemy, and then pick an enemy you feel confident in engaging. Once these steps have been ticked-off, assuming you are above the enemy target, put the Lightning into a gradual descent. This allows you to maintain a speed advantage. As you are descending, make small course corrections, so you don't give the element of surprise away by shooting too soon, overshooting or being within view. When you are about 1-2 seconds away from your target, line your sights up and fire a short burst with your cannon and machine guns. Your target should now be heavily damaged or shot down. If you fail to damage your target, climb back up above using your energy advantage and repeat or move on. Using the Lightning in ground forces (RB) is very effective once you have unlocked the appropriate modules. FMBC Mk.1 allows you to equip 2 x 500 lb bombs, which are mounted under your wings. To help get the bombs on target, put the plane into a steep dive. As you near the ground, drop the bombs then pull up. Make sure you either pull up with altitude to spare or have a timed fuse to avoid crashing or blowing yourself up. The M10 Bazooka module allows you to equip your P-38J with 2 triple Bazooka launchers. These are attached to the lower nose panel, and are very accurate. These are ideal for destroying tanks and bunkers. Once the enemy ground units have been destroyed or you run out of external ordnance, you can use the Lightning to help maintain air superiority. This will help you secure that much wanted victory. The concept of the plane was made in February 1937 when the US Army Air Corps made a requirement for a plane that had twin-engine and can act as an high-altitude interceptor that can hold a large amount of armament and ammunition. The term "interceptor" was used for the aircraft by the requirement authors, 1st Lt Benjamin S. Kelsey and Gordon P. Saville, to bypass the Air Corps' strict requirements on aircraft designs at the time. The specifications laid by this new requirements also called for a maximum speed of 360 mph (580 km/h) and able to climb to 20,000 ft altitude in six minutes, making it the most tough specifications at the time. Design proposals were made for the specifications, one of which would become the Bell P-39 Airacobra, but it was the Lockheed design team headed by Hall Hibbard and Clarence "Kelly" Johnson that made the final product. They made many designs with a twin-engine configuration. The prototypes made for the design used a twin-boom design to hold all the components of the aircraft. Various armaments were tested on the aircraft, from different machine gun combinations and auto cannons. It was finally settled to four x M2 .50 cal machine guns and one Hispano 20 mm auto cannon. The aircraft armament configurations, all at the nose of the aircraft, was very unusual for an American aircraft design, as most of their designs and those of their foreign contemporaries had the armament mounted on the wings angled forward. Because of this mounting, the aircraft is able to fire at a longer distance accurately than wing-mounts. The P-38J model of the series was introduced into service in August 1943. Its distinctive form is the movement of the turbo-supercharger intercooler system from the leading edges of the wings to in between the oil coolers of the engine to protect them from combat damages. Thus, the J models of P-38s have a distinctive "chin" in the engine design. The empty spaces on the wing now made room for fuel tanks for an additional 55 gallons of fuel when installed. Other improvements in the P-38J's was a hydraulically boosted ailerons and flat bullet-proof windscreens. 2970 P-38J's were built during its production period. The P-38 performed very well in the Pacific and European theaters during World War II. They were used in roles such as bomber and transport escorts, performing reconnaissance, Combat Air Patrols, ground attack, Search and Rescue and other important and critical roles. 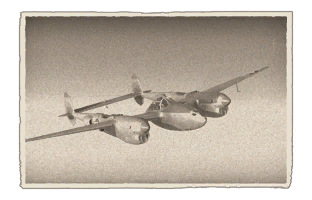 Unfortunately it is estimated that only five P-38J's survive to this day. Only two of them are still airworthy. This page was last edited on 23 March 2019, at 14:08.